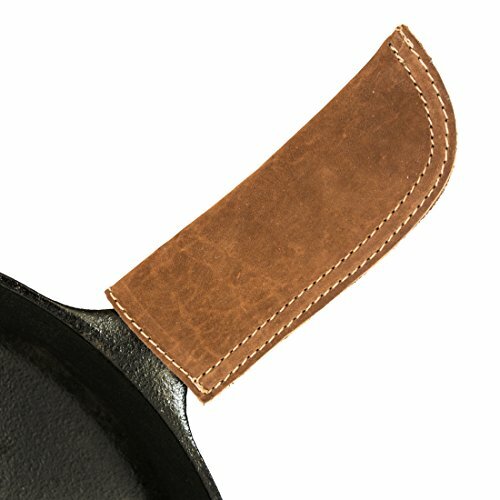 These handcrafted, heat resistant Panhandle Covers in Swayze Suede are designed to fit cast iron or metal handled pots and pans, for the chef who has it all. This stylish addition will add some flair to the kitchen as you create your culinary masterpiece. Handcrafted with a soft sheepskin on the interior, the Panhandle will fit on seamlessly, and the soft yet sturdy Swayze Suede leather will protect your hands in style from temperatures up to 450°. This unique product will make a perfect gift for all foodies and chefs! All our Suede Hide & Drink leather products are handmade from rustic, soft Swayze Suede. Our Swayze Suede comes from the top layer of the hide, and has all the natural full grain characteristics of the hide...hence the name. It's the best leather you can buy and the only leather that we use. DURABLE DOUBLE LEATHER LAYER OFFERS PROTECTION UP TO 450-DEGREES: The double layered leather provides excellent insulation to prevent any burns as you take the Skillet off the fire, giving you a protection against high temperatures. Note that these Rustic Leather Pan handles are designed for levels of heat-proofing, they are not fireproof - do not place in the oven. 3D Rose Well Worn Baseball Pot Holder, 8" x 8"